Cold chain refers to the temperature-controlled supply chain for uninterrupted storage and distribution of refrigerated products. The global cold chain market is predicted to grow at 9.4% CAGR during the forecast period with the market size reaching USD 325.9 billion by 2024. The major factor fueling the growth of the market include increasing demand for temperature control system to avoid health hazards, increasing penetration of e-commerce in food and beverage industry and increasing demand for convenience or processed food across the globe. Based on the type, the cold chain market is categorized into refrigerated transport and refrigerated storage. Of both the categories, refrigerated storage holds the larger share in the market. With the huge demand for processed food, the demand for refrigerated storage is also very high to cater to the demand of large population base, globally. Also, the demand for refrigerated transport is increasing at the faster CAGR during the forecast period, due to the increasing demand for processed or convenience food in the retail sector and increasing adoption of the online distribution channel. On the basis of deployment type, the cold chain market is segmented into bakery & confectionery, fish, meat & seafood, fruits & vegetables, dairy & frozen desserts, and others. 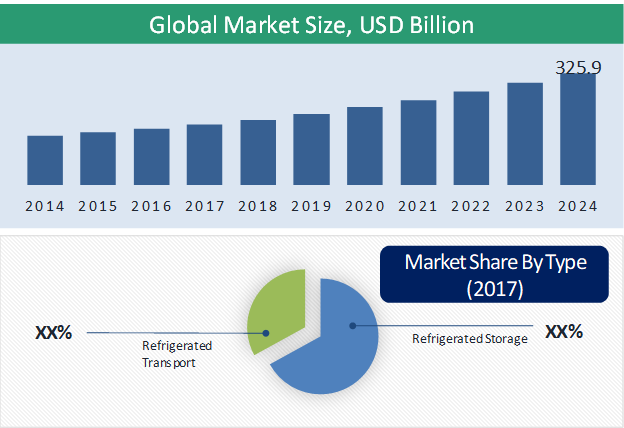 Of all, the cold chain market size is the largest for fish, meat & seafood and is anticipated to witness the fastest growth for dairy & frozen desserts during the forecast period. The demand for cold chain systems for fish, meat & seafood is the largest due to the dependence of large population, globally on the animal-based food products, and due to the enhanced chances of contamination by microorganisms if not kept at the desired low temperature. The increasing demand for processed food and increasing need for its preservation, increasing demand for temperature control system to avoid health hazards, increasing penetration of e-commerce in food and beverage industry are the key factors leading to the growth in the cold chain market, globally. Refrigeration plays a key role in food processing as temperature control is key to preserve food throughout the supply chain and increase its shelf-life. Refrigeration remains the primary method of preserving food products from any microbial growth leading to its contamination. Moreover, consumer inclination towards convenience foods with least amount of chemical preservatives uses further supports the demand for refrigeration in the supply chain for storage and transport purpose. Refrigeration is vital in ensuring the consumption of safe food with regard to microbial, nutritional and organic quality. With the changing lifestyle and urbanization, people tend to visit retailers or grocery outlet once a week, therefore, fruits & vegetables, meat, and dairy products must have a shelf-life of a minimum one week. This supports the growth of the cold chain market, globally. 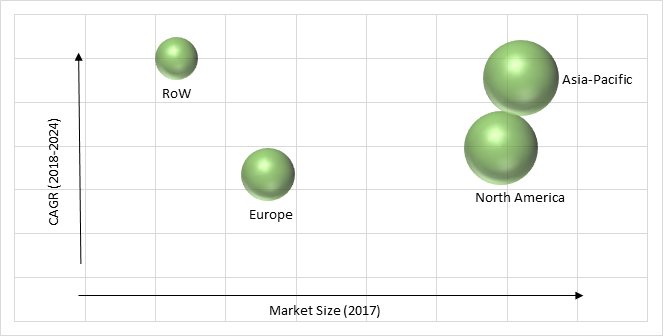 Key factors hindering the growth of the cold chain market are the high cost of infrastructure and high energy requirements. In addition, the increasing concern regarding the emission of greenhouse gases is hampering the growth of the market. Geographically, Asia-Pacific is the largest cold chain market and is also anticipated to grow at the fastest CAGR during the forecast period. The large population base, increasing urbanization, increasing demand for processed food are the key factors for the largest share of the region. Also, increasing foreign direct investment (FDI) inflow in emerging economies such as India, Vietnam, and Indonesia, is leading to the expansion of the market leaders in the retail industry into these countries. Table 203 Snapshot – Kloosterboer Group B.V.